You should wear Polyester! These polyester palms are kind of the bomb - am I right? A little bit Don Knotts circa 1960's (for those of you familiar with the Andy Griffith Show). Keep up with my outfit ideas and inspiration here. #YSW - You Should Wear will bring you all sorts of fun takes on my fave vintage finds, prints, patterns, colors and eccentric outfit choices. One word: Koto. 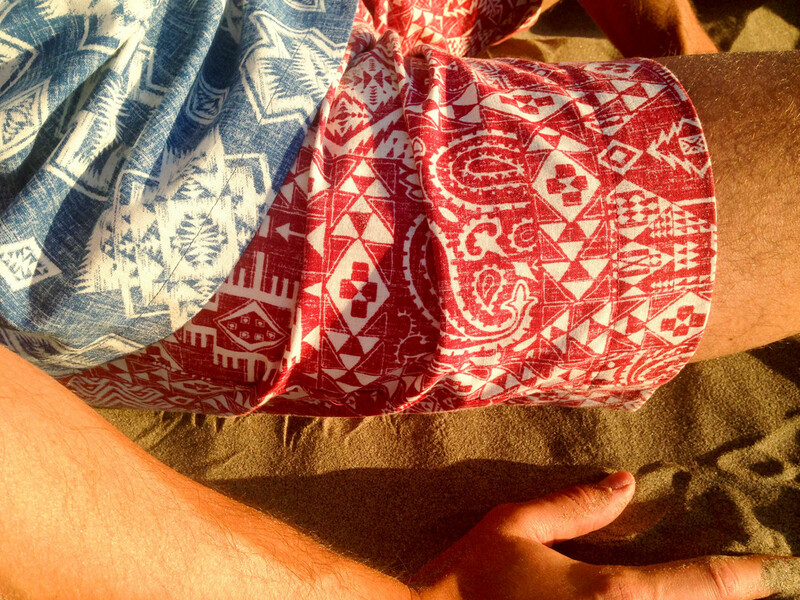 The epitome of eclectic-bohemian prints and powerful patterns. Unique shapes and cuts for Men, Koto has envisioned clothing for a new era of style savants. This sunflower shirt is just damn cool. It's fashion dandy meets too cool for school skater dude. I am increasingly impressed with the floral print menswear options these days. 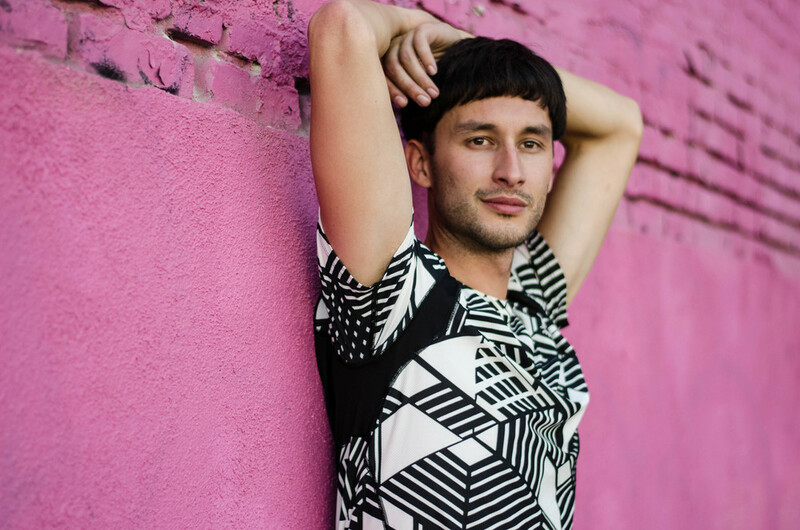 Men's fashion is being redefined not only by designers producing more gender neutral clothing but also the explosion of patterns and prints that were once considered suitable only for womenswear. Get ready to start seeing this shirt around town, these sunflowers are popping up all over the internet as I type these words. Power to the print! Sweaters hold a soft spot in my heart (pun intended). Though this vintage wool sweater isn't technically soft, I fell in love with the geometric shapes instantly. As per usual I layered the sweater with an obnoxiously loud button down shirt underneath, perfect for a Fall/Winter look. This week I spent a lot of time thinking about vintage blazers. I often buy suit jackets and blazers with the best intentions of wearing them out and about but sadly many of them just sit in my closet collecting dust. I found this killer double breasted red suit jacket months ago here in LA and decided this week it was time I cement it into the archives here on my fashion diary. The color red is often challenging to pull off. It can make your skin look orange and depending on the garment can come across like you're competing with a fire engine or Heinz tomato ketchup. You've got to style the color red selectively. I found that wearing black underneath a red jacket really offsets the brightness. In this instance I threw on a vintage shirt with an abstract pattern found in the OC and paired it with a bolo tie I discovered in Shelton, Wa at a tiny little thrift shop. The culmination of all these pieces may just make me look like a circus conductor from the 1950's set somewhere in Texas or Arizona - but I am okay with that! I embrace the eccentricity of mixing and matching these colors and styles. I hope it inspires you to try something new with your wardrobe! It's no secret that I love prints...especially TROPICAL! Having Hawaiian heritage certainly attributes to my passion (obsession) for these retro Aloha shirts. I remember as a kid having to wear Aloha shirts for family portraits and they never seemed to fit me right, always too boxy. After years of thrifting I've finally found a rhythm in finding the ones that fit me just right - not to mention better, brighter, funkier colors. For this shirt I thought it would be fun to pair with a beat up pair of denim trousers to really bring out the blue hues all around. The shoes were recently discovered while seeing my parents over the holidays in Washington. I used to frequent a thrift shop called "Treasures" when I was in high school and it is STILL going strong. Hence these lovely brown leather vintage Clarks. A bit worn, but they felt oh-so right. 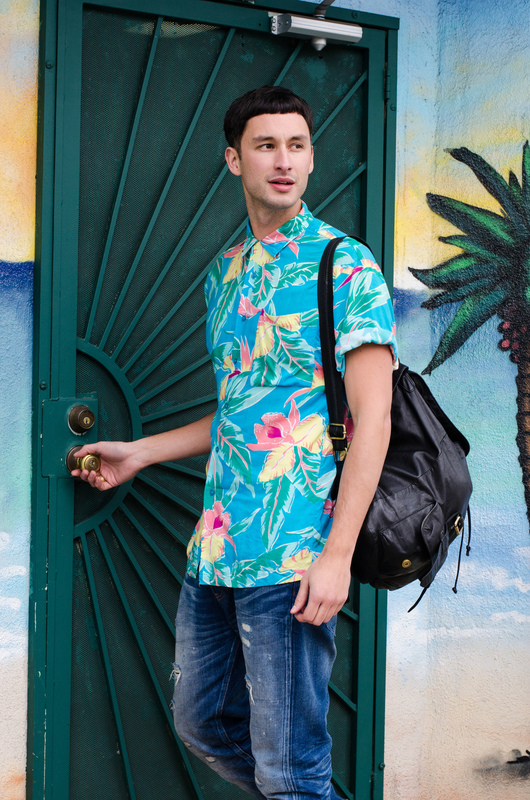 Throw in some blue shoe laces from Aldo and voila - you've got an undeniable Tiki-Urban-Streetwear look. This pink wall downtown (nope it's NOT the infamous Paul Smith wall on Melrose!) was a perfect spot to capture the boldness of these patterns. 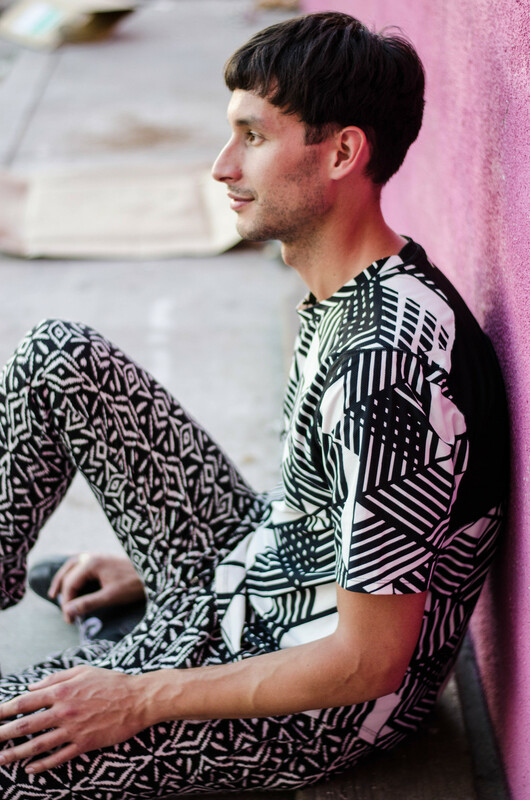 As I'm sure you've already picked up on I enjoy styling mixed patterns and prints...of many kinds. 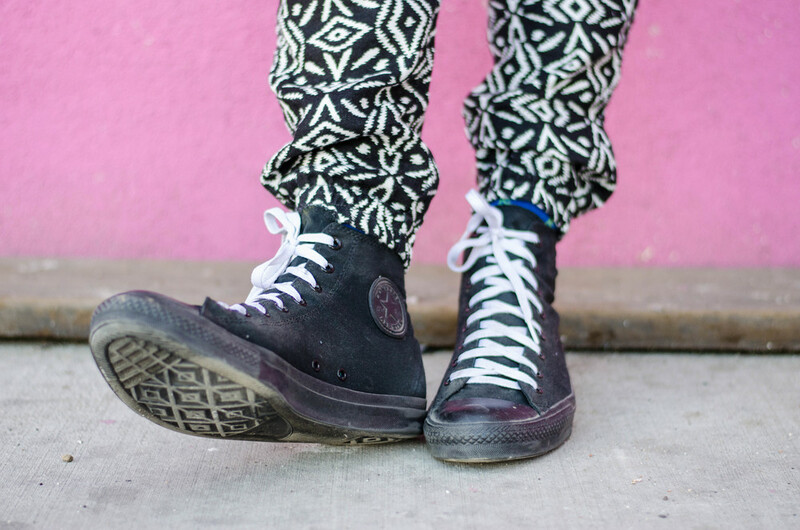 This look features pants by Zara, top by Without Walls, shoes by Converse and socks by J. Crew. Sometimes (always) you've just gotta mix things up. 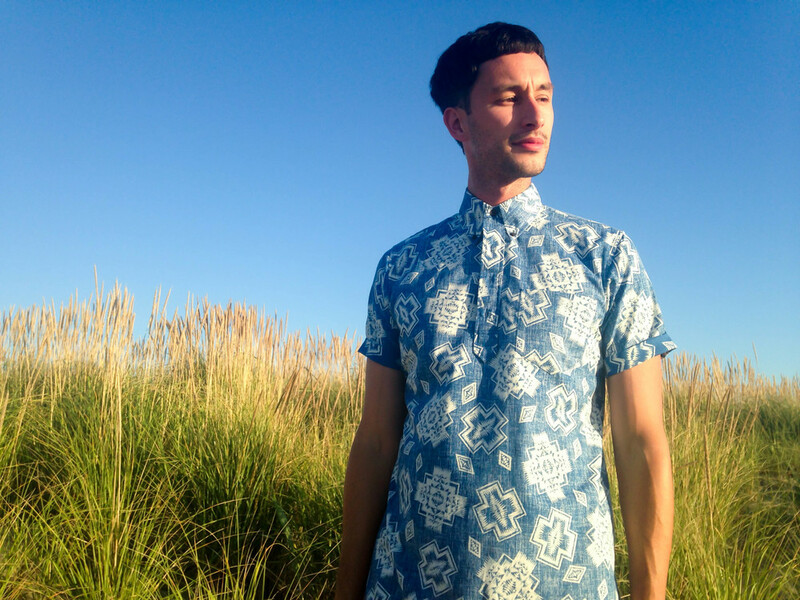 Shirt - Vintage find at Slow on Melrose Avenue, crazy cool detailing on this shirt - digitized needlepoint flowers. Spending the weekend on the Oregon Coast is relaxing...Spending it with your family is absolutely priceless. This weekend my brother and sister in-law flew into Oregon from Hawaii with my nephew Luca, joining myself as well as my younger Sister, Mom and Dad. As kids we grew up visiting Cannon Beach, Oregon almost every Summer. It's been over a decade since we have all had the time to come out for a visit together as one family so this weekend was extra special. As a native of the Northwest it seemed appropriate to stop in at the Pendleton outlet just down the street from our cabin. To my surprise - among all of the Aztec printed blankets, fleeces and button downs - my eyes went straight to a tiki printed shirt and short suit hanging on a rack in the back of the store. Surely this wasn't Pendleton I thought...But it was! I was looking directly at their Surf Pendleton line that actually started back in the late 1960's. Apparently the Beach Boys (originally called the "Pendletone's) sported these classic, wool button down surf shirts on their album covers. After all of these years in Los Angeles how did I NOT know this!? Initially I was tempted to buy the matching blue top and bottom pieces but instead decided to buy the blue shirt and the red shorts for contrast. 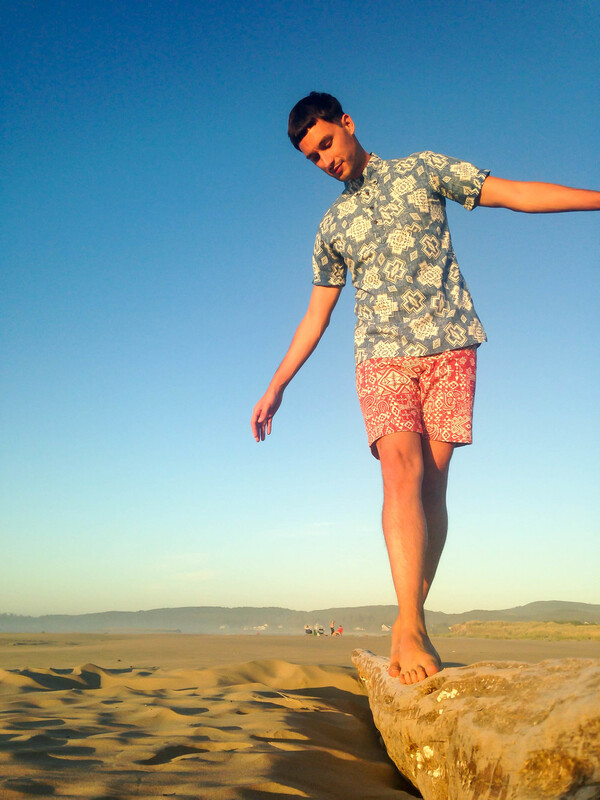 Thanks to my lovely brother and spur-of-the-moment photographer Aaron we grabbed some snaps of this beachy-king look. SURF'S UP! To read more about Surf Pendleton CLICK HERE. It's the the beginning of Fall which for Angelenos means WE WEAR THE SAME EXACT CLOTHES WE WERE WEARING ALL SUMMER! Perhaps even less given the recent 100 degree weather : / There's nothing to report about seasonal specific dressing today - but I leave you with this: Black denim, active wear and a vintage jacket go a long way.